Arne Duncan Wants To Drop 'No Child Left Behind' — But Keep Its Tests : NPR Ed The secretary of education calls the law "tired," asserting that much of it ought to be scrapped. But he still wants to keep the annual exams that serve as the law's centerpiece. Education Secretary Arne Duncan speaks with reporters after he and Attorney General Eric Holder toured the Northern Virginia Juvenile Detention Center on Dec. 8, 2014. In a speech Monday at an elementary school in Washington, D.C., Education Secretary Arne Duncan laid out the president's position on the nation's largest federal education law, even as debate unfolds over the law's re-authorization. 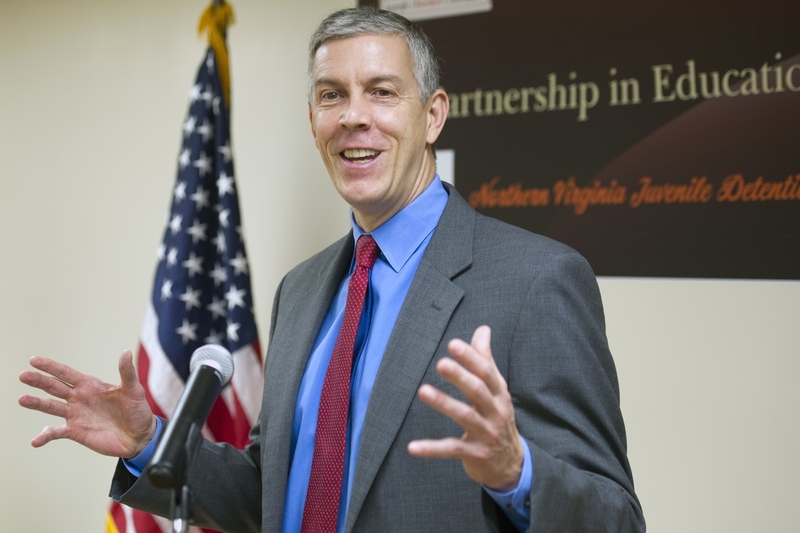 Duncan called No Child Left Behind "tired" and "prescriptive." Nevertheless, he declared that the law's central requirement should stand: annual, mandated statewide assessments from third grade through eighth, plus one test in high school. Some Republicans in Congress have been discussing the idea of reducing or eliminating those testing requirements. In his speech, Duncan invoked famous phrases used by both President Obama and former President George W. Bush, the latter of whom introduced No Child Left Behind more than 13 years ago. "This country can't afford to replace 'the fierce urgency of now' with the soft bigotry of, 'It's optional,' " he said. Duncan acknowledged that high-stakes accountability testing is one of the "hardest topics" in the nation's education debate. He also called, as he has previously, for action on the state and district level to cut back on additional tests which are "redundant" and "unnecessary." He said that the federal government will request funding to improve the quality of tests, beyond the $360 million already spent on creating exams aligned with the Common Core learning standards. At the same time, he wants student test scores to be included in teacher evaluations. The Senate education committee is scheduled to hold a hearing specifically addressing testing on Jan. 20, the same day as President Obama's State of the Union speech. President Obama's budget request will include $2.7 billion in increased education spending. Of that, $1 billion will be designated for high-needs Title I schools. Duncan renewed the call for expanded access to preschool. He also called for distributing funding more equitably among public schools in high- and low-income areas. In 19 states, high-poverty districts receive less state and local funding than low-poverty districts, according to a 2014 report.